Migrating a knowledge base requires exporting from one knowledge base, then importing into another. Create a free account before you begin. Sign in to QnA Maker portal. Select the knowledge base you want to migrate. On the Settings page, select Export knowledge base to download a .tsv file that contains the content of your knowledge base - questions, answers, metadata, and the data source names from which they were extracted. Select Create a knowledge base from the top menu then create an empty knowledge base. Give your service a name. Duplicate names are supported and special characters are supported as well. 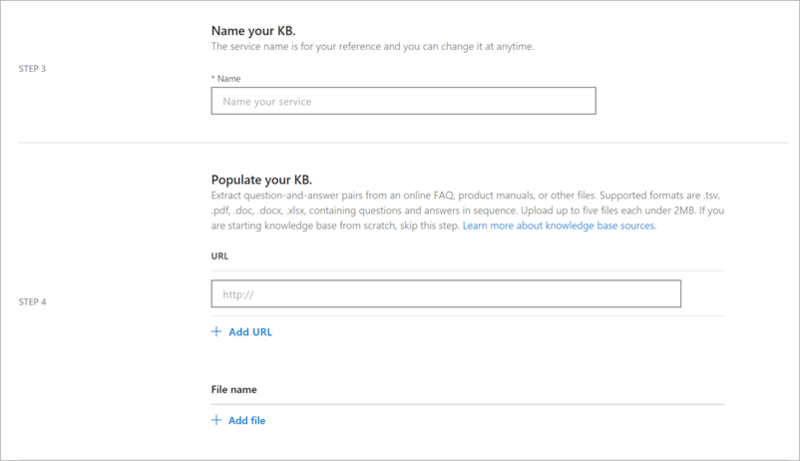 In this new knowledge base, open the Settings tab and select Import knowledge base. This imports the questions, answers, and metadata, and retains the data source names from which they were extracted. Test the new knowledge base using the Test panel. Learn how to test your knowledge base. Publish the knowledge base. Learn how to publish your knowledge base. Use the endpoint in your application or bot code. See here how to create a QnA bot. At this point, all the knowledge base content - questions, answers and metadata, along with the names of the source files and the URLs, are imported to the new knowledge base. Case-insensitive alterations (synonyms) are not imported automatically. Use the V2 APIs to export the alterations from the old knowledge and the V4 APIs to move the alterations in the new knowledge base. There is no way to migrate chat logs, since the new knowledge base uses Application Insights for storing chat logs.